I have a feeling I'll end up having to get an automatic. Boo. Article + more photos. OMG. Mamamatay ako sa ka-cute-an ni Hisashi. I don't even know what will happen to me when Squall comes to this point. I dread it every day. 9th-Jun-2013 04:50 pm - Squall Sunday! My sister and I didn't really plan any itinerary before going on the trip. But she did ask her friend about transportation, so the first thing we did as soon as we landed (well, second, after getting some HK dollars from the ATM) was to get ourselves Octopus cards. As usual, I got to be the communicator. I seem to have this weird talent of making myself understood by (and being able to understand) people with different accents/languages. Which is weird considering I'm totally bad at speaking and communicating in everyday life. Anyway, Octopus cards are really useful especially if you plan on using the MTR a lot. Taking selfies while waiting to be checked in. Just as soon as we were able to check into the hotel, we shot off to Disneyland. We missed the hotel shuttle direct to the resort, so we got on the shuttle to Tung Chung station to take the MTR to Disneyland from there. 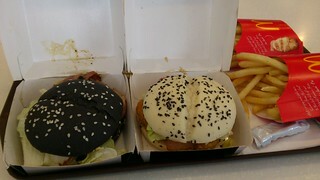 But before going to Disneyland, we had lunch at the McDonald's at the Citygate mall in Tung Chung station and tried their limited edition Black and White burgers. I had the Black, and it was very good! It sort of tastes like the Big n' Tasty, but with a crumblier burger, and mashed potato dressing, and bacon. My sister had the White, which was a more peppery McChicken, also with mashed potato dressing and bacon. 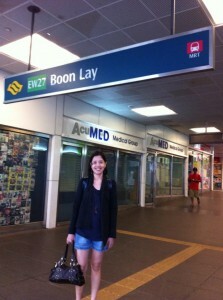 I thought the MTR would be confusing, but it was actually pretty easy. The directions were all written in both English and Chinese. 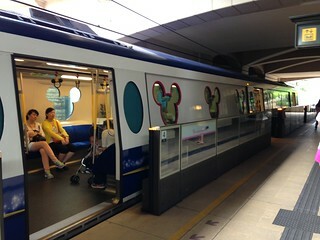 We were able to successfully make the transfer to the Disneyland express train, with the not-so-hidden Mickey windows and stuff. So cute! The next day was very rainy, so we mostly just stayed in the hotel. 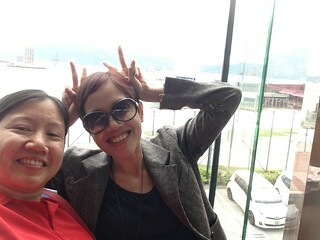 We did go to the Outlet store in Tung Chung for a bit, and had our lunch at the Food Republic. We looked at a lot of food stalls there, and ended up choosing the Taiwanese stall (if I remember correctly). 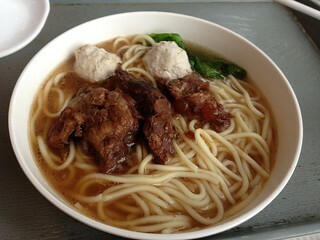 The pork and meatball noodles I had was delicious! My sister's was nice, too, but I think I got the tastier dish again. LOL! After that, we looked at the outlet stores for a bit, but we weren't really in the mood to shop. We ended up buying a lot of sushi to eat for dinner because we knew we wouldn't have time to go out anymore after that evening's Glay concert. Glam shot. But that's how they were styled during the actual live. 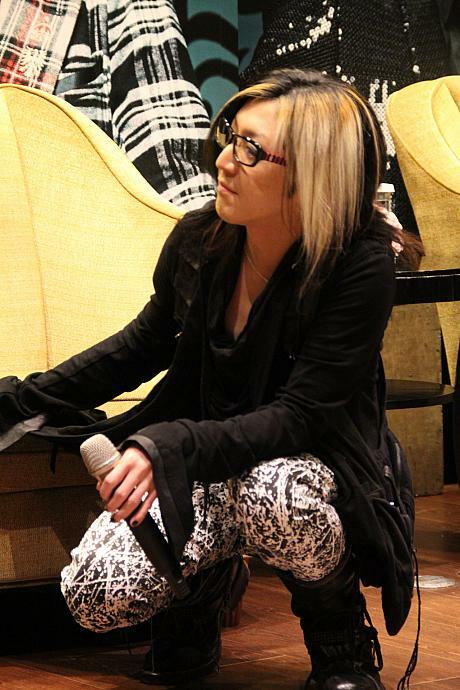 Hisashi is really lovely in real life! I can't take my eyes off him. Mostly dedma lang siya pero may stage presence at ang lakas ng dating. And I love his outfit! Red plaid skirt-pants with knee-high brown boots. Black jacket at first, and then he changed to white after the intermission. Eye candy! Hisashi had a majorish blooper during the intro of Beloved. It was so cute! He started to mess up just as Teru was about to enter with his vocal, and then just gave up with a jarring TWANG on his guitar. Hahahaha! Pampasira ng emote. 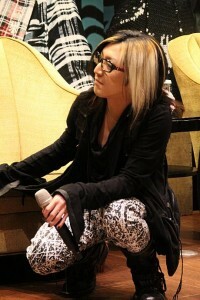 Teru still went on singing, though (so professional! 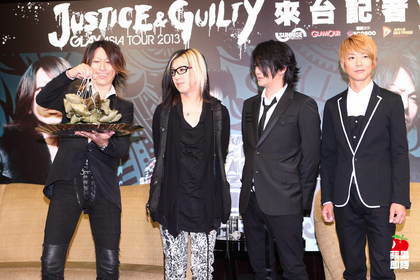 ), but Hisashi stood up and stopped him, apologizing for his mistake. 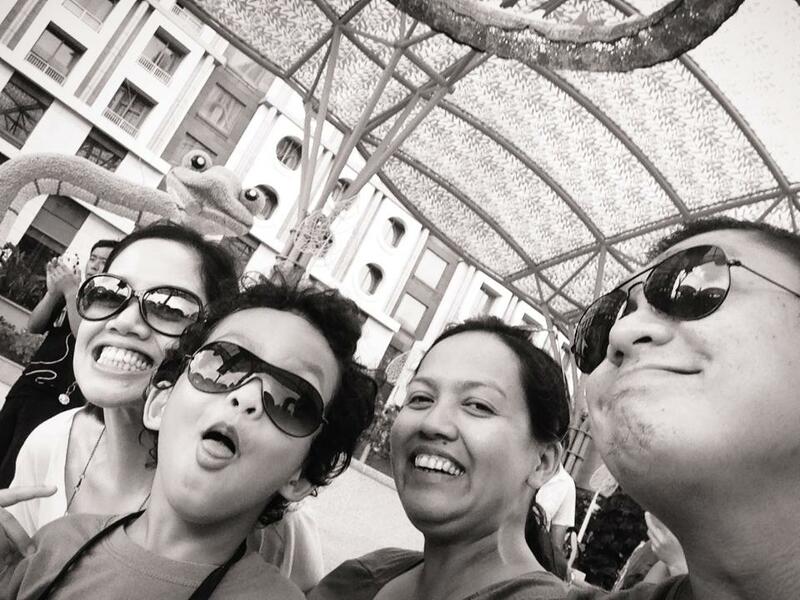 Sobrang cute talaga, I swear! I tried to look for a video upload on YouTube, but I don't think anyone captured it on video. Sayang... [Found a video!] 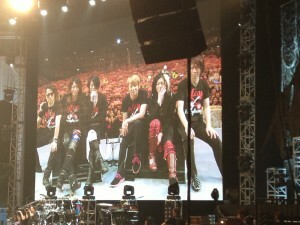 The second time around, the cam focused on Hisashi na, and the audience was hooting at him. And then he grinned and giggled a little. Ayyyyy... my knees turned to jelly! 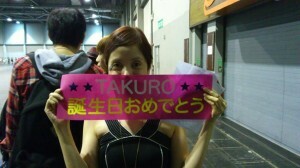 Surprise of the night was Takuro -- he's megahot in real life. My sis says he's who she constantly looked at, especially when his abs peek out of his shirt. Hahaha! 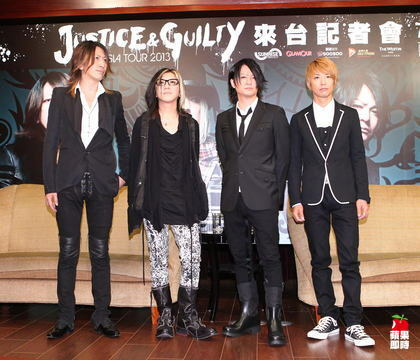 I must admit, of all the GLAY members, he's the most well-preserved of all. He looks almost exactly as he looked 10 years or so ago. And his leeeeeeeeggsssss. Abot hanggang langit sa haba. 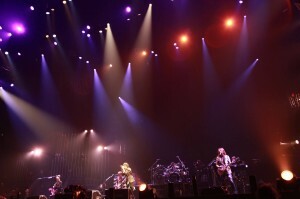 They performed only about two or three songs from their new albums. Of course, they opened with Justice from Guilty. E di hyper agad ang crowd! The rest were classics like Mermaid, Soul Love, Be With You, However, Just in Love, etc. The audience sang the birthday song for Takuro, who's celebrating his birthday the next day. Benedict Cumberbatch guests on The Simpsons as the voice of the British Prime Minister... and Severus Snape! 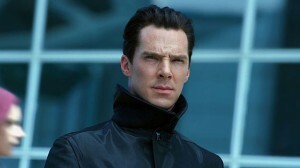 Because albatoudilandau was wondering why I wasn't saying anything about his hotness, Benedict Cumberbatch. Come to think of it, maybe Cumberbatch's silky basso profundo has a lot to do with it. His voice makes me weak in the knees every time I hear it. Kirk and Spock are so the OTP of OTPs. 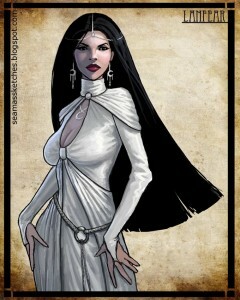 Meanwhile, reboot!Spock should lose Uhura. I don't think it's just me; they really don't have any chemistry at all. May kinikilig ba sa scenes nila? I don't think so. While K/S "friendship" scenes always get reactions. Also, Leonard Nimoy should stop with the cameos. I love him and all, but it's getting stale. PS I have lost all my favorite K/S author bookmarks. Any recs out there? And are there any good fic writers for the reboot version? 18th-May-2013 08:26 pm - Happy 13th Birthday, Squall! It's Squall's 13th birthday today! Can you believe it? If he were human, I'd already have a binata. I never imagined we'd be together this long, and I'm thankful for every minute that I have spent (and will be spending) with him. My sister got Squall from her friend, whose dog gave birth to a litter of puppies. 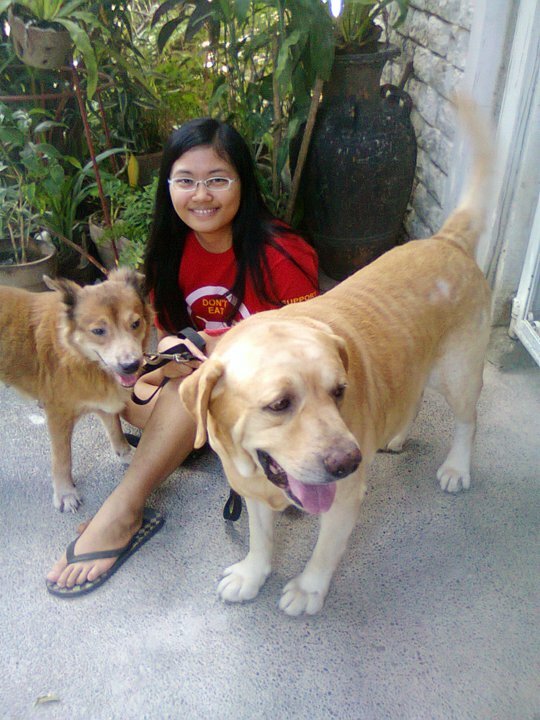 My sister had first dibs, so she chose the only black male, because most of the dogs we had were either red or brown. He ended up red when he became an adult, though! LOL! When we first welcomed him in our home, I still had Zawie, so I didn't really bond with him that much. 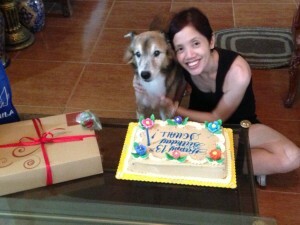 (I'm a loyal, one-dog human.) My dad was the one who took care of him, and then after my dad passed, my sister and her husband took over his care. It took a couple of years after Zawie's passing before I warmed up to Squall (and he to me). I was grieving and didn't fancy giving my heart up for another dog to break. But what can I do? Dogs have the talent to worm their way into your heart, no matter how much you try to wall them out. 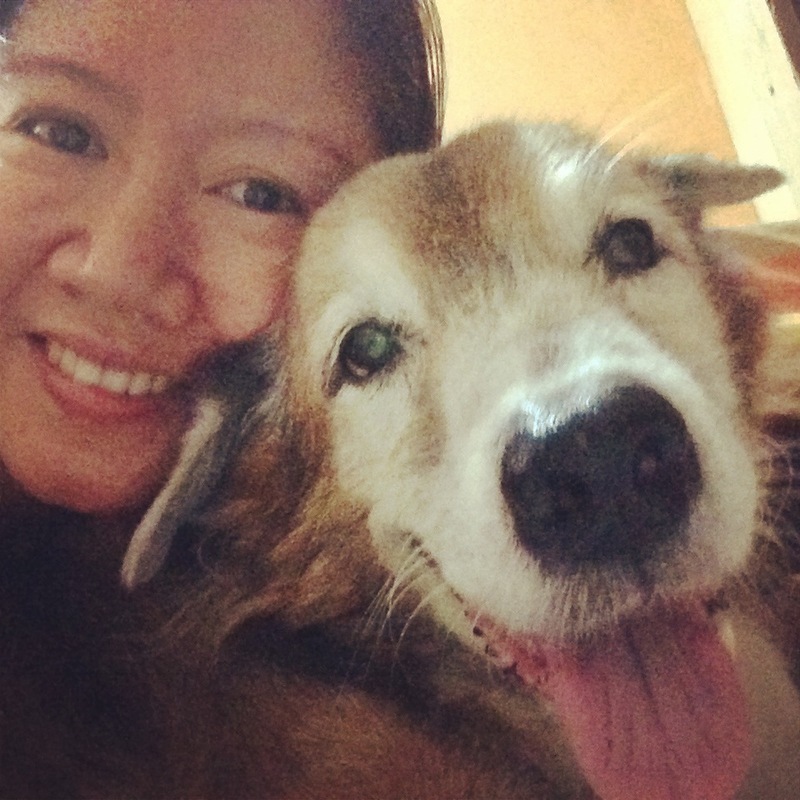 I think the first time I realized how much I already care about Squall was when he had a fight with another dog -- he was bloody and bruised, and I wanted to take him to the vet but he wouldn't let me, and I got so panicky that I had to call my sister at work (or maybe in school, I don't remember). It took him a lot longer to trust me, and with his trust also came confidence (and a bit of spoiled-brattery), but then the rest is history. 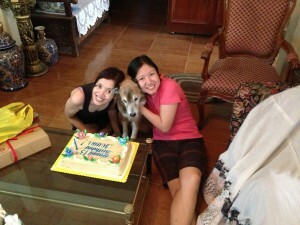 Now I dote on him and he tolerates me. Hahaha! I am back to my very short pixie haircut. I'm too cheap to get my hair rebonded, and it's at the stage where it's horrible-hair-day everyday. So I had it all chopped off. I got my hair dyed red. Again. This time it's KC Conception red. The color didn't suit my complexion the last time, it still doesn't suit me now. Makulit lang talaga. I'm a redhead-wannabe e. The vibrant red is fading pretty fast, though, thanks to this extreme hot spell which makes me want to take a shower three times a day! 10th-Apr-2013 09:07 pm - i'm back! The examiner commented that I had bad handwriting. Hahaha! And then he took it back and said he wasn't really saying my handwriting was bad, just that I needed more practice. XDDDDDD Binawi pa e! Same rin naman! LOL! Well, he's right, anyway. I admit my handwriting is horrible. Not just with hiragana and katakana, but in general. I've never really written anything longer than a few words by hand ever since I started working on web design. Puro type-type na lang. Hehehe. Meanwhile, I'm thinking of taking beginner Korean, too. Hmmmm. 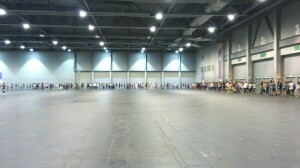 Now I understand why lines form outside of Forever21 when they have a sale. - black long-sleeved vintage-cut lace dress with leather trim for PhP 300+ (I love this one!). I actually don't know why I keep getting these promotions. It's not like I put myself out there. But it's a mixed blessing, really. Politicking people didn't use to have me on their radars, but now they're coming out of the woodwork. *sigh* Times like these I'm really glad I'm a rational-thinking, logical Virgo. Although sometimes even I am tempted to retaliate. So far, though, I've been able to keep my cool. Karma karma na lang yan. My happiness doesn't depend on anybody's approval anyway. The only thing I can do is my best. Basta ako, I know I'm not stepping on other people's toes or pulling other people down to get where I am. It's my bedroom's turn to get renovated, so my PC has been disassembled and moved to the living room. Of course, the first thing I re-set up was the Wi-Fi. Because we need that like air now. Haha! Nasanay na. If I receive the files for my sideline work, If the urge to watch season 2 of Merlin is too great, I might set up my PC tonight as well. Marathoning Merlin. Talk about being late to the party! (The series ended December last year.) Haha! Final words for season 1: Pleasepleaseplease don't have Gwen and Arthur end up being together. They're so awkward! 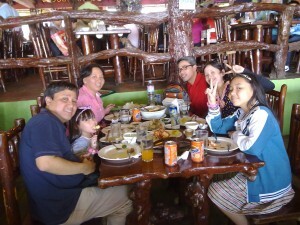 Had a family lunch for Jane and her boyfriend, YR, today at the Gateway Mall. Mommy planned the whole thing, but Catin and I ended up paying. Wut? LOL! For the rest of my Singapore trip, please go to my annotated photo set (Flickr). I think I mostly just ate while I was there. Let's see... the first day I had a huge lunch at the McDonald's in Changi Airport (courtesy of Louie, who picked me up at the airport). And then some toast and mini kaya buns and milk coffee in the afternoon at the Star Centre Mall (also with Louie) while waiting for Sherelyn and Sam (and my concert ticket). And then we had huge bowls of noodles at EAT in Jurong Point Mall for dinner. The second day we had breakfast at Subway before heading off to the cable car ride to Sentosa Island. And then we had a late lunch at the Malaysian Food Street there, where we had Nasi Briyani, satay, Hookien Mee (which I couldn't eat because it had prawns), and egg roti canai. 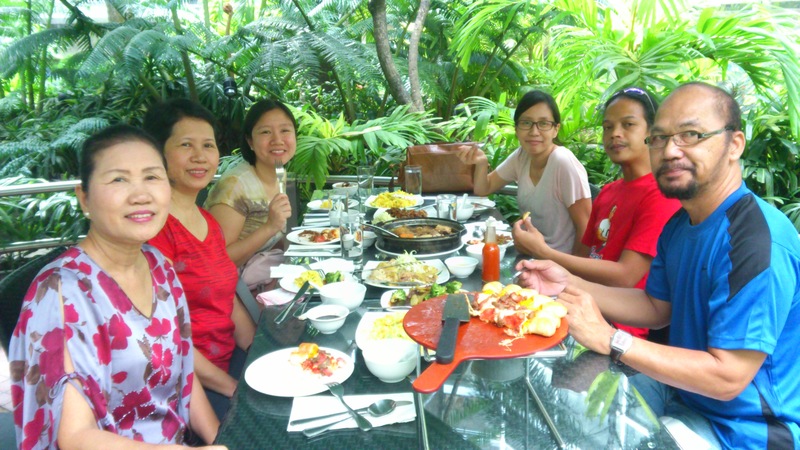 And then we went to Orchard Road and had dinner at a park there with food stalls. I had a huge platter of fish and chips. 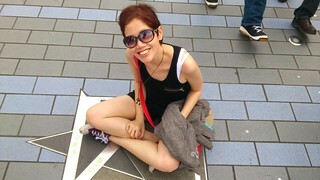 Super-delayed update, but as I've already posted previously, I flew to Singapore last February 8 to watch Luna Sea's show at the Star Performing Arts Theatre. I had second thoughts about going, mostly because I was already low on funds from last December's BigBang show in Hong Kong, but also because I'm not too into Luna Sea during the recent years anymore. I figured I already saw them perform live before anyway (at the hide memorial concert in 2008), so seeing them again wasn't such a big deal anymore. But I'm glad I decided to go. 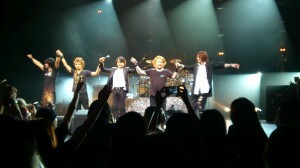 The show was so much fun, and I'm actually finding myself getting back into Luna Sea again! I was also lucky because I found someone selling her LS Singapore Street team ticket, which was located on Row 4! I was very close to the stage and can almost touch the band (well, not really haha!). 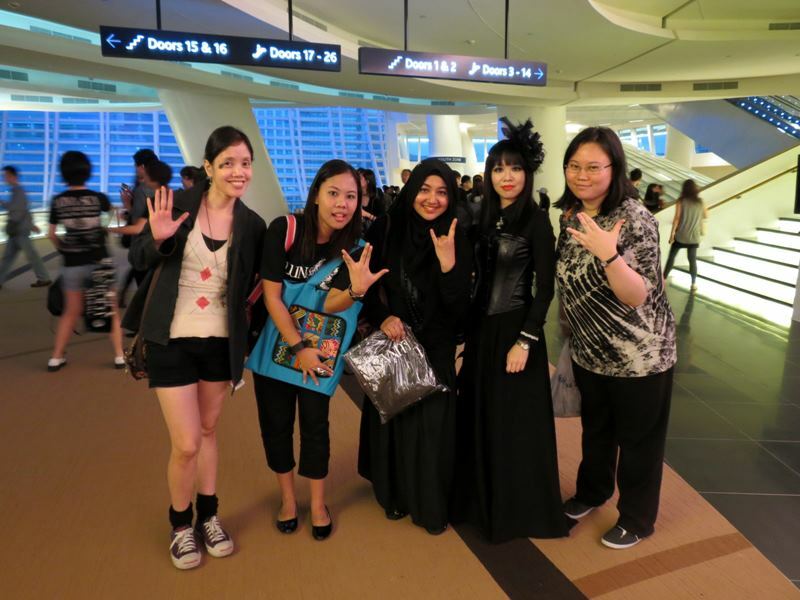 But I was close enough to be in the photos Sugizo took of the audience and posted on his FB page: photo with Sugizo, photo of the Singapore audience. I was shell-shocked when Ryuichi first appeared on stage, and when the rest of the guys came out, all my old Luna Sea feels just came rushing back. Sobrang parang bumilis ang heartbeat ko and I felt cold all over. I almost cried when they performed Gravity. I just couldn't stop jumping and screaming and shaking. Hay. Nakakawalang poise. And then I got goosebumps when Sugizo played the opening violins for Providence (I think I would have dropped dead if he played Until The Day I Die instead, pero nakakataas pa rin talaga ng balahibo). And to think I had second thoughts about going. First few songs pa lang, super worth it na ang effort at pamumulubi sa pagpunta. 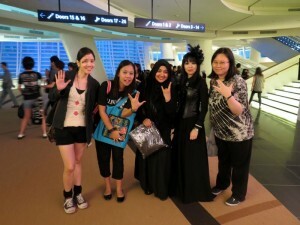 I also met some other Luna Sea Slaves from Southeast Asia. Ang saya-saya! I only know Mae from before, and she introduced me to the rest. They met each other at the Inoran/J Meet and Greet. I like Riko's outfit! She says she's going to be cosplaying Hisashi on the Glay tour. Too bad she's going to the Bangkok show so I won't be able to see her. Awwwwww. I was too late to get a shirt and hoodie from the merchandise booth. T____T The tour goods sold out pretty quickly. When I got there, there were only towels and a few corny stuff left. Yesterday, we had an impromptu General Assembly at work for our company's tenth anniversary, and I got called to speak in front. Ugh. I probably sounded like a complete ditz, as per usual when I'm forced to talk before a crowd. Parang interview portion lang sa Miss Universe. So squirm-inducing. I think I just got another promotion, but I'm not sure. Let's wait and see. 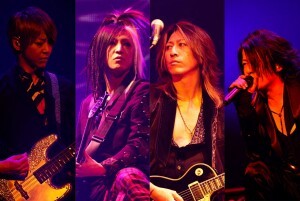 I GOT TICKETS TO THE GLAY HK CONCERT ON MAY!!!! Why are the Southeast Asian Luna Sea Slaves so young? Shouldn't the majority of their fans be in their late 20s or 30s by now? These kids were probably toddlers when Luna Sea was still active back in the day. Hehehe. 2nd-Feb-2013 08:38 pm - hi! Between my horrible internet connection (PDLT is so retarded! ), the busywork at the office, and the GLAY Facebook parties with fellow addicts bathala and cugami, I haven't been able to update my journal for over two weeks. I almost forgot to mention: I met another random person who recognized me from my Saber Marionette Lime cosplay way back in 2000! I mean, I know my face is pretty distinctive because of my birthmark, but to actually remember that they saw me at that event... wow! Our costumes weren't even that good. Haha! And in other news, my sister gave me her Sony Xperia! I finally own a smartphone (and a smartphone endorsed by Arashi, no less). Hindi na dyahe maglabas ng phone sa first-world countries. LOL! I noticed straight away that the Rand on the AMOL cover art is nicely painted. He isn't depicted as a short, fugly, old man, but more like his descriptions from the book (tall, young and somewhat attractive). I actually have no complaints! So I did a search, and apparently the original artist (Darrell K.Sweet) passed away before he could complete the final cover. That's sad. But I can't say I'll miss his work. Anyway, here's the article with images of his covers. 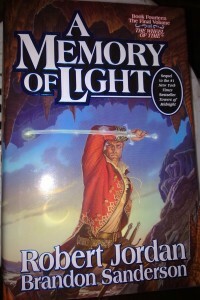 You have to agree that the AMOL cover by Michael Whelan is a nicer reading reference than any of Sweet's. The paper used for the TOR hardcover is not the same thick, high-quality paper usually used on these releases. It's thin and more like paperback paper. Maybe it's so that the physical book won't be so heavy. I guess it's okay. The book is thick enough as it is. And now time for a re-read of the entire series. Robert Jordan's writing. Yes. Months frequently go by without me getting the urge to buy new clothes and shoes and other fashiony stuff. But the one month I restrict myself from buying anything, I start seeing a lot of things I absolutely have to get! >.< I just don't know. I guess the holiday + post-holiday season is not the ideal time to cut down on spending. So on the first weekend of my supposedly no-shopping month, I already bought myself a super-cute yellow blouse. (It was on sale for P100 so I guess that's okay?) And my mind's currently obsessing over a pair of Bench silver sneakers on sale at 50% off (and in my size), and a gray plaid dress with leather straps (super-original design, and it's only P205). And, oh, those ubiquitous floral shorts! Should I get them or not? 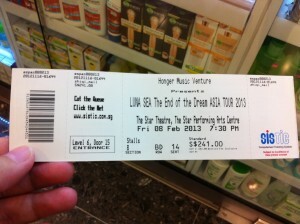 Meanwhile, I've (mostly) decided not to go to the Luna Sea concert in Hong Kong this February. I'm just not as excited about it as I should be. Maybe it's not yet time. Anyway, I've already seen them play before so it's not like I'm missing my chance at seeing them. And I'm thinking they'll probably be playing bigger venues/shows in the future, anyway. Apparently I also promised myself I'd be more conversant in Japanese the next time I go, but I think I'm worse now than I was then. But I had so much fun! 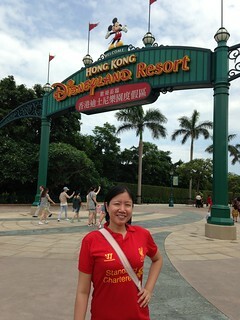 ♥♥♥ I really should go visit again soon. I think the universe has sort of punished me this year for complaining about 2011 being boring on my previous year's recap. This year was anything but! I would have been ecstatic if all the excitement was fun and shiny, but a good deal were stressful and made me want to poke people's eyes out. Well, actually all the stressful bits were work-related and only involved a couple of major major asshats, and I think I came up somewhat on top near the end there, so I guess I'm still pretty lucky. 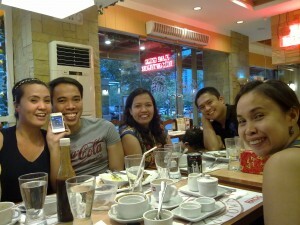 Having a late lunch at Rack's with Melai, Jester, Sherelyn, Louie, and Des. 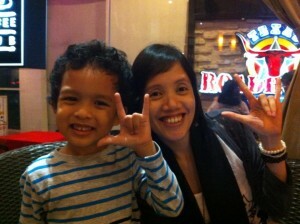 With Sam, my inaanak, at Bo's. 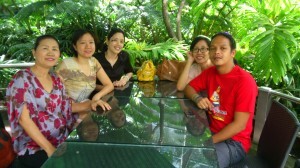 Having lunch at Leslie's with Lolo, Cali, Aireen, Funji, and Aenea. Food here at Leslie's wasn't great. At all. 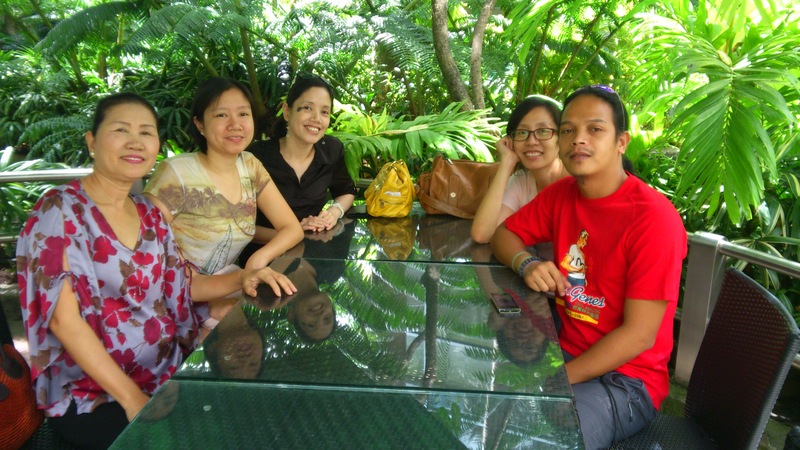 And our server was suplado (he turned his back on us while we were still confirming our orders for drinks). Highly not recommended. 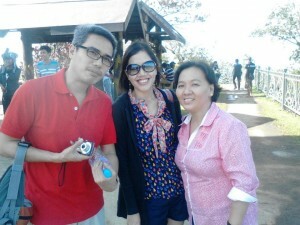 At People's Park with Funji and Aireen. People's Park looks good in photos, but sadly, the place just isn't worth visiting anymore. The place is dilapidated and looks like a palengke. The entire lower level is filled with tiangge stalls. I wonder where the P30 entrance fee per head is being used for.